Cyrus Highsmith is a Senior Designer at the Font Bureau in Boston and faculty member at Rhode Island School of Design. He has been called “one of the truly original new voices in American type design” on account of his vast range of new typefaces, alongside numerous revivalist projects. I met Cyrus while at RISD and he has since left a lasting impression on my approach to typography and type design. 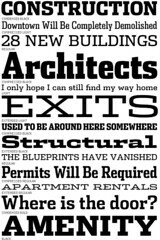 Cyrus was kind enough to answer a few questions for us, sharing some insight into his type filled world. Christian Palino: With so many typefaces being designed every year, last year Stephen Coles noted at least 1,800 new commercial typefaces for 2006, what is the criterion of “good” type design? Do you think that criterion is different today than it was for someone like W. A. Dwiggins? 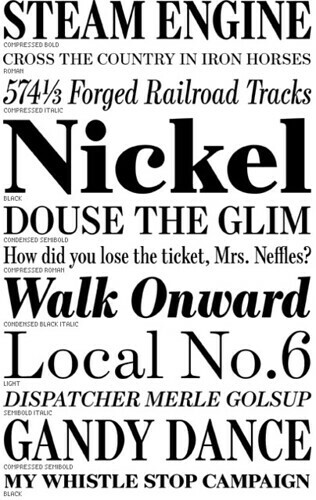 Cyrus Highsmith: I look at typefaces in the context of their intended use. The spring semester at RISD is about to start and I will be teaching my type design elective. The students can draw whatever kind of typeface they want to, but they have to define the kind of document it will be used in and how their typeface will be used. The more specific they can be, usually the better the semester goes, and the better the results. Without this context, it is hard to say very much about a typeface. I think this was true in the old days also. To me, the really interesting question now is what is the effect of 1800 new typefaces a year on the reader? Not only are readers exposed to all these different typefaces, they are being exposed to more different kinds of typefaces. I wonder what effect this is having. It is making readers more sensitive to typography or less sensitive? or both? CP: Its a good question, certainly if the reader is bombarded with more and more typefaces then one could generalize that the sensitivity to type becomes duller, but that doesn’t account for variety. And what about quality, that must have an effect on the reader as well. How do you answer these questions? CH: My focus is working with the typographers who are choosing and setting the type, and to a lesser extent working with the engineers who are designing the type setting systems. The type designer is just one small part of the process of creating a document. In the big picture, I just want people to keep reading. If typography gets so bad that literacy rates actually go down, then we are in trouble. 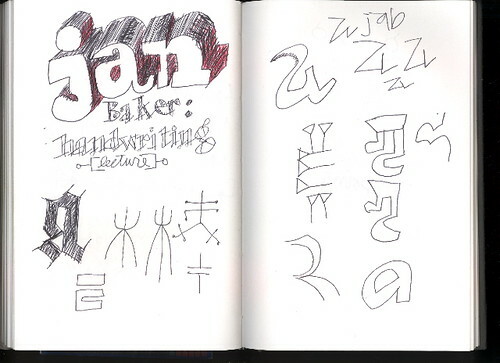 CP: On one of your sketchbook pages there is a note about “Jan Baker: handwriting” which reminded me of John Hegnauer’s penmanship and how emphatic he was about the importance of good handwriting. Any thoughts on this? CH: I am writing my responses for this interview by hand. Later, I will type them. (or actually, now I am typing them). The reason for this is that when I write by hand, and I can see the pencil or pen marking the marks on the page, all these different parts of my brain light up. Ideas flow better. I remember what I write by hand longer. So for me, handwriting is an important thing. However, I don’t have very good handwriting in a traditional sense! If I sit down and focus, I can do pretty nice lettering. But that is a different kind of thing for me. CP: I’m similarly committed to writing by hand. And I should note that John’s idea of “good” handwriting was not akin to that of our school teachers in respect to being “neat” and traditional, but more interested it seemed in the energy and personal style of the handwriting. Are you concerned at all that as today’s youth become more and more dependent on machines to do there note taking and message writing that something could be lost? CP: In a recent interview for TheAtlantic.com, Michael Bierut mentions that a font (I think typeface is more appropriate here) is always in service to a greater purpose. Would you agree with that statement? From your perspective, does a typeface always have a lesser purpose than the service to which it is applied? CH: I agree that is usually true. When setting text, the function of a typeface is to convey the content. It shouldn’t attract attention to itself. However, the typeface still plays a big part in setting the tone of voice. 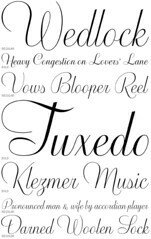 One of the most important decisions the typographer makes is what typeface to use. As someone whose work to date is not largely revivalist and prefers to explore their own ideas, how do you relate to the past masters of type design? CH: I see the work from the past as something that can be built on. It is something I have studied and continue to learn from. In terms of my own work to date, it is true I have focused on creating new designs. This was a goal I set out for myself early in my career. It is what interests me. I was trained in a method quite compatible with what Berger describes though. I worked in the background, assisting in the drawing of other people’s typefaces. Hopefully, you cannot see more than one hand in these series. It is a great way to learn. CP: You recently released Escrow, a new Scotch based upon Monotype Scotch No.36, which was developed for The Wall Street Journal, certainly a paper that relies heavily on typography. Can you tell me about the process involved in such an undertaking? CH: It was a very exciting commission because the Wall Street Journal is not only a world class paper, but a paper whose character is very typographic. Also, it is the newspaper my grandfather reads. I like that my typefaces show up on his breakfast table on a daily basis. The WSJ didn’t call Font Bureau one day and say “we want to commission a new typeface for headlines.” They called because they were doing a redesign and they knew they had to do something with the typography. We had some meetings and discussed the old typography, and the goals of the redesign. Eventually we focused on the headline typography and we sent them a lot of different typefaces to test. Based on those results we kept narrowing things down until we ended up with a description of a typeface that didn’t quite exist. So I did some sketches and made a plan for the different widths and weights, got the clients approval, and then I got to work. This is often how the process works. It just starts with looking at the typography and asking questions, and trying things out. CP: Could you tell me about what some of the questions are that you begin asking about a typeface that you’re planning to redesign or build upon? CH: I just try to find about as much as I can from whoever I can get in touch with: the designers who use it, the person who drew it, other experts. I like learning about the historical context it was drawn in, what it was drawn for, the technology it was drawn for. It varies from project to project. Of course, if you are building on existing work there might be intellectual property issues that need to be figured out also. Fortunately, I have co-workers to handle that part of it. CP: It seems that you spend a lot of time drawing cartoons and illustrations (many of which appear to feature a Cyrus-like protagonist!) 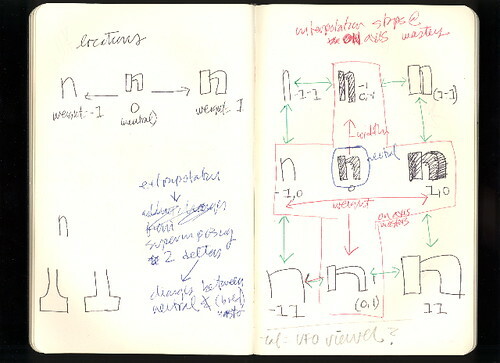 outside of your work, do these drawings help inform your type design process? CH: Yes, I like drawing, letters, cartoons, illustrations. I am obsessed with black and white. To me black and white is full of color and depth. Maybe my eyes are wired funny. So all these kinds of drawing feed each other. Drawing letters informs drawing cartoons and vice versa. CP: Stanley Kubrick obsessively employed Futura Extra Bold, a torch now taken up with the addition of other weights by Wes Anderson. Have you given any thought to which of your typefaces you would like to see on the big screen and for which films? CH: No, I haven’t thought about it actually. It would be cool though. I always enjoy seeing any of my typefaces in use. I would be interested in doing some lettering and/or drawings for some film titles. CP: Any film titles that particularly inspire you? CH: I don’t think I can impress you with anything very obscure unfortunately. I think Saul Bass’s titles for The Man with Golden Arm are probably my all time favorites. Of course, the musical score also plays a big role these. CP: You work on a wide range of kinds of typefaces (scripts, display, text, novelty), and I know that you’ve said that this is very important to the way you work as a type designer. Could you tell me about that? How does that feed into your process? Are you working on different faces in parallel? CH: As a professional, I think it is important to get experience drawing as many different kinds of typefaces as possible. Personally, I like the challenge that comes from drawing a script versus and newspaper textface. The number of series I am working on at once often depends on what my schedule is like. I usually like to break up the day by changing gears with different projects. The trick is to learn how to stop at a place where you can pick up again easily later. Being able to pace yourself and take breaks can really benefit the design process. CP: Martin Majoor feels that when developing a type family, a sans face can be developed from a serif but should not be done the other way around. Are there any design/development rules that you live by? CH: I have my tricks and habits, I suppose. Looking at things upside down is helpful. Drawing the white shapes rather than the black shapes is something I always do. CP: Are there any current design trends or developments that you feel appear potentially detrimental or problematic? CH: I see a lot of stuff I like and a lot of stuff I don’t like. That’s ok with me. I just want to draw. Sometimes it seems like there is some kind of technical conspiracy to slow us type designers down or something. I have probably said too much already. CP: Who else is inspiring you lately in the type design world? Are there any recent faces that you find particularly interesting or beautifully done? CH: Lately I am interested in what’s going on with Arabic. There seems a lot so energy and enthusiasm coming from this direction. CP: Can you tell me about what’s next on the horizon for you? CH: Ornaments. I have a very modernist background. I grew up in a house full of Scandinavian furniture and got a very Swiss education at RISD. I don’t regret any of that but lately I am getting interested in ornamentation and fiddly little bits of decoration. It’s a whole new world for me. CP: What is your least favorite word? CP: What turns you on creatively, spiritually or emotionally? CP: What turns you off? CP: What is your favorite curse word? CP: What sound or noise do you love? CP: What sound or noise do you hate? CP: What profession other than your own would you like to attempt? CP: What profession would you not like to do? CP: If Heaven exists, what would you like to hear God say when you arrive at the Pearly Gates? Nice interview. I’ve read a couple of interviews with Highsmith before, and I like his realistic / rational look on things. 1. Cyrus is an innovative typeface designer. 2. Highsmith is the today Dwiggins. It’s interesting that typefaces can create such a mood, convey certain feelings just by the width of the stroke or the lean of the letter. I agree with Highsmith that writing by hand instead of the computer releases more ideas and lets more ideas flow. 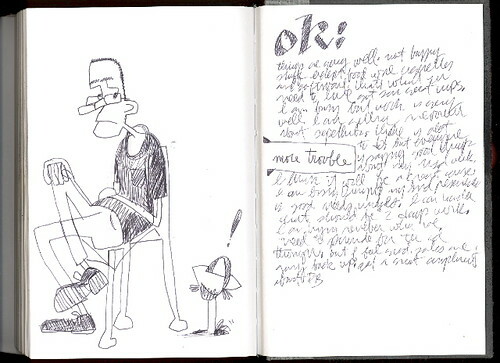 Many designers start thinking on paper and then transfer sketches to the computer for good reason. A computer screen has limits — actual boundaries of which you can’t draw out of. Paper has limits, but you can always draw off of the paper, although I’m sure parents and spouses of the world wouldn’t like that!